Malaysia is a place to keep an eye on. The nation of 32 million already hosts some of Southeast Asia’s biggest esports tournaments, and recent financial commitments from both the federal government and international investors ensure a bright future for Malaysian gamers. Find out what esports in Malaysia is all about, including the best places for local gamblers to have a bet online. Before you put down so much as a single ringgit, you need to find a licensed online sportsbook you can trust. 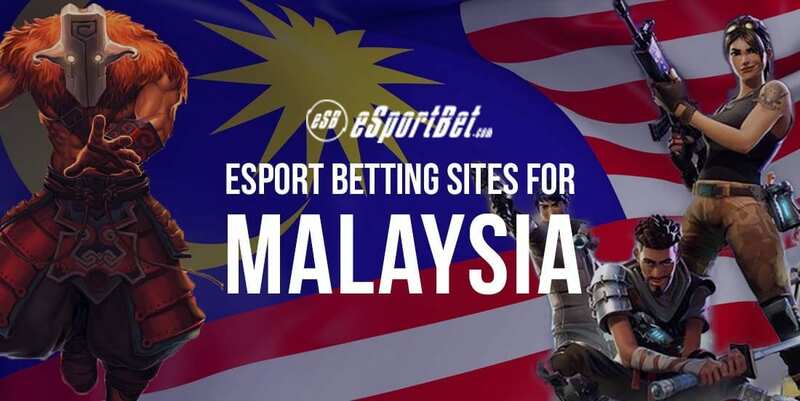 All the esports betting sites above accept gamblers from Malaysia, and we recommend checking out each of them to ensure top value every time you bet. Once you have signed up, you need to add money to your betting account. Leading esports bookies support a wide range of secure online banking options, including credit cards, debit cards, e-wallets, prepaid money vouchers and major cryptocurrencies. When making your first deposit at an online bookie, be sure to check if you are eligible for any bonus offers or special promotions. Most betting operators run deposit match specials for new customers, so make certain so you don’t miss out. After you have put cash in your account and opted in to any bonus deals that take your fancy, it is time to start betting. Scroll through the esport games menu and all the different leagues, tournaments and matches until you find the bet you want, then tap the odds to add them to your virtual betting slip. Set your stake, confirm the wager, et voila – you’re on. Malaysia is home to one of the world’s fastest-growing esports communities. As such, it is now a sought-after destination for esports tournaments in Southeast Asia. Below are a few of the better-known events to be staged in Malaysia in recent years. Launched in 2018, the Kuala Lumpur Major is one of the highlights on the Dota 2 Pro Circuit. It is the largest event of its kind in Malaysia and boasts a total prize pool of US $1,000,000 (RM 4.18m). Russia’s Virtus Pro won the inaugural KL Major, defeating Team Secret in the best-of-five grand final. After a couple of years in the wilderness, the Malaysian Cyber Games returned in January 2018 with eight different events over two days. The tournament features a wide variety of titles, ranging from esports classics (Dota 2, CS:GO) to traditional fighters (Street Fighter V, Tekken) to virtual sport and racing (FIFA 18, F1 2017). Formerly the Garena Premier League, the SEA Tour is a League of Legends competition that features teams from Indonesia, Malaysia, the Philippines, Singapore and Thailand. The champion team represents the region at major events such as the Mid-Season Invitational, Rift Rivals and the LoL World Championship. Most betting sites also accept money wires and direct bank transfers. Withdrawal methods and transaction times can vary from bookie to bookie, so make sure you read the ‘Banking’ section of the website before you cash out. The Malaysian gambling scene is an interesting one, due in no small part to the country’s ethnic makeup. The Muslim majority follows Sharia law, but there are prominent Chinese and Indian communities where the attitude to betting is far more relaxed. There is a legal system just for Muslims and a separate one for the rest, but the legislation for gambling is rather straightforward across the board. Most forms of gaming and wagering were outlawed when Malaysia gained independence from the British Empire in the 1950s. The only exceptions to that ban were lotteries and horse racing, both of which remain popular. Resorts World Genting on the Pahang-Selangor border remains the only legal casino in the country. Online gambling is something of a touchy subject in Malaysia. There are no laws that strictly prevent residents from placing bets over the internet, yet the government has issued no licences for real money casino sites or sports betting operators. Thus, most punters take their business offshore – much to the chagrin of lawmakers and tax collectors. Change is in the air, however, and the future of Malaysia’s online betting industry is uncertain. The authorities have made a show of stamping out international gambling rings in recent times, while Muslim leaders want even more prohibitive legislation for all Malaysians. What does that mean for esports gamblers? For now, the situation is much as it ever was. You can still have a bet over the web, but always at your own risk. Be cautious, be smart, and you should have no problems.